Following on from our 2017 activation which was live streamed into Facebook Live, BAFTA and their sponsor Virgin wanted to go bigger, better and be more immersive. 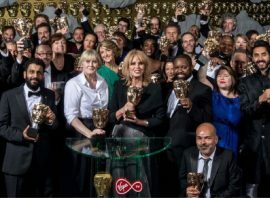 The Virgin and BAFTA teams were keen to give this year’s audience the chance to select from multiple live 360° cameras and give them the opportunity to track a celebrity across the whole of the red carpet. Groovy Gecko partnered with Holoscribe who specialize in creating 360° environments. It was their first live activation and GG were able to provide 3 live camera feeds for them to render into their platform. The result saw a number of ‘zones’ created within the Holoscribe app which viewers could select and move between and they would be taken to particular parts of the red carpet. This meant viewers could track celebrities as they walked the full length of the red carpet for a truly unique experience. Live info graphic overlays were also added in real time to the live feeds so viewers could look at info on particular actors as they were on the red carpet or about the film itself! By using this technology, multiple rooms / zones can be captured to allow viewers to control their movement around an environment while having live data or on-demand HD video played into the 360° stream.